As this series has unfolded it has been shown that it is all too easy to blunder quickly on, in so doing missing out crucial information. In that respect fundamental knowledge on lathe spindles and their importance to successful chucking has largely been overlooked, so this Fundamentals chapter is an attempt to remedy this omission. First off, a small but true anecdote, concerning a lathe spindle, and some thoughts that might be helpful. 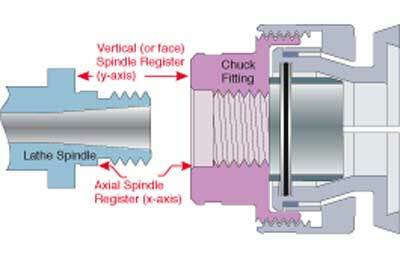 A few years ago a woodturning tool supplier rang a chuck manufacturer with a customer complaint: he could not remove his new chuck from his new lathe spindle, and even worse, it was not running true. It transpired that the customer had started the chuck on the spindle thread by hand, and then switched the lathe on to drive the chuck into place. Well, it worked, and as an anti small tool theft plan it was difficult to fault. Fortunately a blow torch and a lump hammer did the trick. He was lucky, but not on the concentricity front - the lathe turned out to be a cheap Far Eastern copy of a well-known English machine. These are the surfaces designed to ensure that chucks, (and other such equipment, like faceplates, etc), run concentrically. Ideally registers should be machined as an integral part of the spindle, and consist of an axial (x-axis) register diameter which centralises the chuck on the spindle, and a vertical (y-axis) register which holds it ï¿½squareï¿½ on the x-axis. 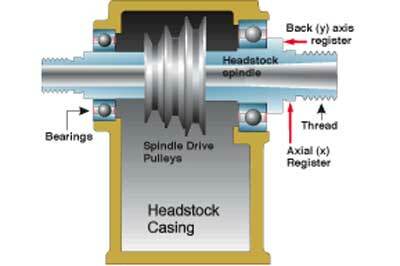 The chuck should have a matching bore register, and an accurate flat back face. This arrangement reflects good manufacturing practice, and avoids the possible problems arising from poorly made machines. Having said that, lathes lacking that refinement are not necessarily visually inaccurate, and if one is buying a low-price machine rather than a lathe for life, one can always buy another later. 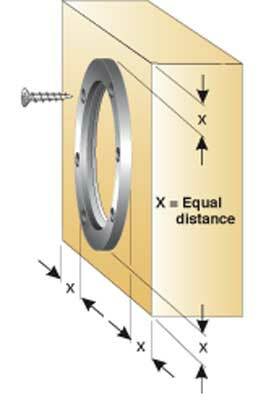 Without an x-axis register on the lathe spindle there is a risk that the chuck will not run concentrically. In any event wear on the threads over time will exacerbate the problem. 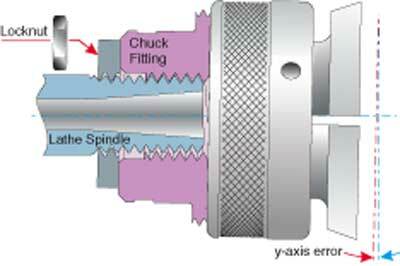 A bigger problem could be encountered if a lathe spindle also lacks a y-axis register, because this would allow the chuck to droop and give rise to a progressive axial error. 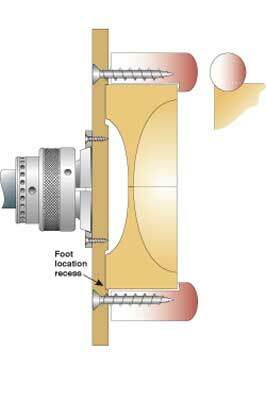 However, a locknut is normally supplied to provide some form of back face, and whilst this does improve matters, it is still open to the vagaries of thread accuracy, and wear. 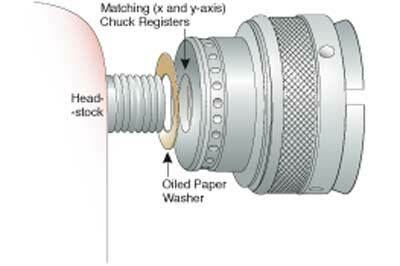 Fitting a chuck, or other equipment, on a lathe: to avoid getting a piece of equipment stuck on the spindle, make a paper washer - preferably from a hard thin piece of printing paper, and coat it in machine oil or WD-40. This will make removal far easier. Although most turners have an aversion to oil, a small amount wiped on the register and thread would not go amiss. With lathe spindle and chucking sorted, we can turn our attention to further workholding techniques.The objective this time is to devise a procedure that incorporates a number of different holding elements based on making a round-dished square bowl with four feet, the feet being achieved by sawing the workpiece into four parts, and juxtaposing their positions - joints indicated by darker brown lines. This also introduces a pleasing marquetry-like variation to the appearance of the chosen wood. 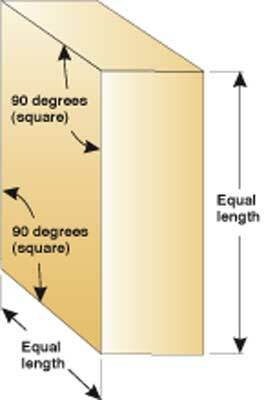 For the purpose of this exercise the blank is assumed to be about 150mm (6in) square, and about 55mm (2 1/8in) thick. In reality the principles hold good for any practicable combination of sizes. An interesting addition might be to consider if the bowl were to be made in a dark-coloured wood by inserting a slim layer of a contrasting wood, or veneer at the joint line at the gluing stage. 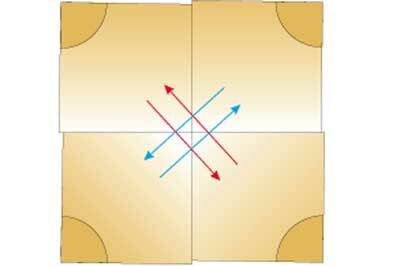 Make a blank in your chosen wood with equal sides, and with each side square to its neighbour. At this stage one face can be planed flat to save remounting during the turning operations. However, the sequence proposed here assumes that both faces on the workpiece will be turned. Screw a faceplate ring centrally onto the workpiece face. A Vernier calliper is very useful to help position the ring accurately. If you don't possess one, it might be worth a visit to your local hardware store to pick up a cheap steel version. 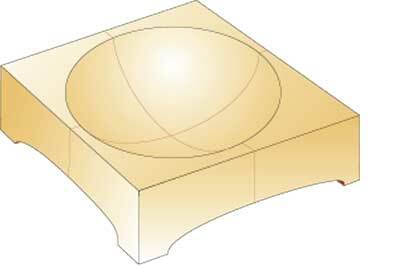 Turn the base to form a curved boss shape approximately 16mm (5/8in) deep. 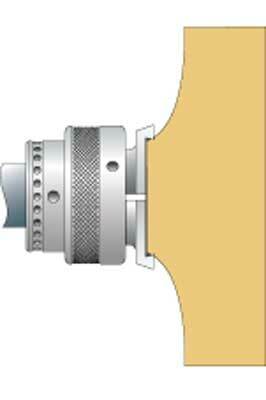 The boss diameter in this example was based on cutting a 50mm (2in)-diameter groove to accommodate the internal dovetail jaws of the chuck. Remove the faceplate ring and remount the workpiece in the jaws. 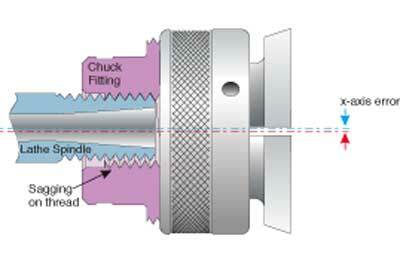 Adjust as necessary for concentricity and tighten the chuck. Skim-finish the top surface. 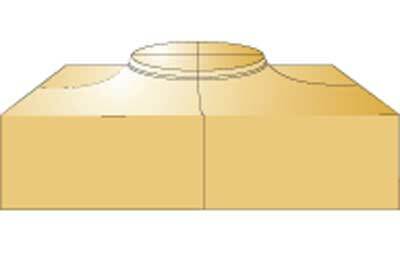 This method ensures the top-to-bottom thickness is even across the workpiece. Saw the workpiece into four equal squares, ideally on a bandsaw. It is not a major problem if the sawn sides of the blocks are a bit out. The view shows how little effect an off-line cutting error of as much as 4mm (5/32in) would have. Any such error can easily be corrected by re-planing or sanding. The red and blue arrows show the repositioning of the blocks so that the original square planed sides can be mated and glued together. The feet are created from the boss in each corner. 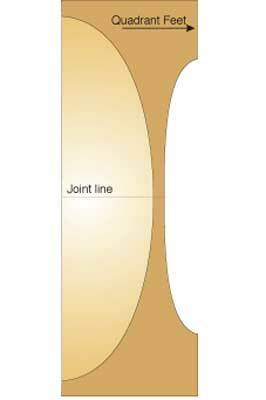 As the procedure should have created a parallel surface (top face to bottom face), it should be possible to do this face down on a piece of MDF board, so that the joint lines of the blocks are more or less blended with little or no sanding required. Try to complete the curve at the outer edges as square as possible because this will help blend the under surface of the blocks after gluing. Alternatively, if gripping on the boss with jaws is not possible, use the faceplate ring to turn the top face first. 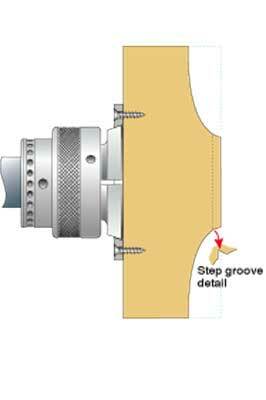 This, the final stage, could be done by using wood-plate jaws, or add on plates, however, assuming these are not available, the final turning can be accomplished using a faceplate ring with an MDF disc large enough to accommodate four hardwood posts, and with a recess to locate the foot corners of the bowl accurately. Turn out the dish recess, and finish. 3. Hopefully the forgoing has helped a little in understanding some of the mechanics of mounting chucks etc, onto lathe spindles, and how to overcome some of the problems one can get in this area.